My recreation of the scene in LEGO bricks where you must dispose of the cube into the incinerator. Portal was one of those games that game out of no where. Released as an add-on to the Orange Box, the Half-Life 2 box edition for consoles, the puzzler shined. Combining wry humor with entertaining game play, Portal gained a place in pop culture. In one of the more memorable levels, you are given a weighted companion cube. This heart embossed cube replaces the more generic ones used in early, and later, levels. 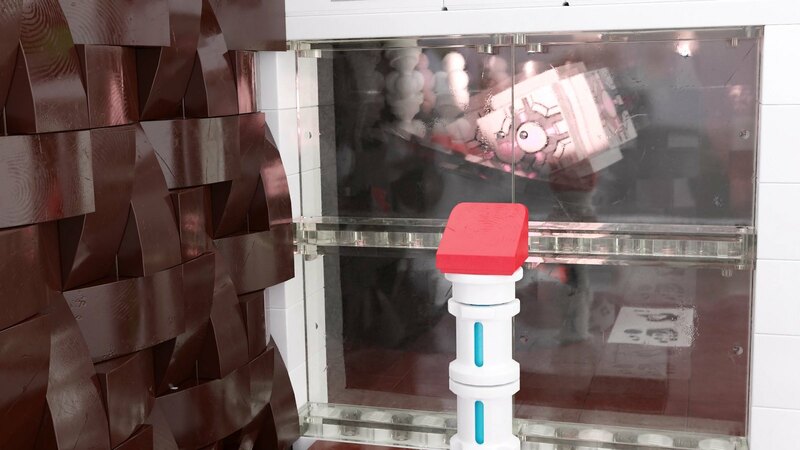 Given a game filled with loneliness, the companion cube helps fill that void. Portal does such a good job of hamming it up, that it comes as a surprise when you must dispose of the cube to continue on. Its heartbreaking, even if the cube is an inanimate object. As an iconic part of the game, I was excited to replicate it in LEGO bricks. The release of companion cube hearts printed on 4x4 LEGO tiles was my inspiration. 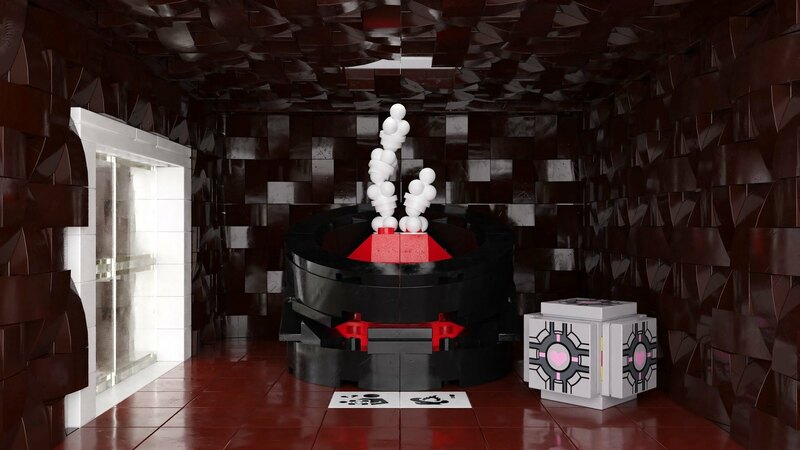 Created for the LEGO Dimensions video game, I knew the perfect place to put it: by the incinerator. But, the companion cube ended up taking awhile to get right. I went through a few different versions before settling on this one. It is the closest to a cube, if not quite one. Given the game's walls and floors are squares, it made it easier for me to design using LEGO. Yet, the walls werent flat. They had a bevel to them so you couldnt use your portal gun. I tried different designs and layouts before settling on the small bows. The incinerator too went through iterations until I found a version I was happy with. Although not obvious from the picture, the room is buildable from real bricks. But, I dont know how affordable it would be to do so. To complete the room, I also modeled new tiles after the ones in front of the incinerator in game. I swapped my images in for the placeholders Id used. This render of that was actually my second. You can find my first one on Flickr with the placeholders there. Although the first render was what I wanted, I wondered how it might look from the button room. Playing around with positioning, I liked the dramatic look of the cube falling to its death. Since I hadnt intended to show that room, I had to extend it and build the button pillar for the final scene. One problem I had was that the cube was too dark. To correct the problem, I added a reddish spotlight to the scene. Not only did it illuminate the cube, it also gave it a nice eery look that emphasized its death. Although I prefer this version, others may find the other more appealing. To me, it was obvious that the designers were using the companion cubes death to set up the final battle with GLaDOS. In searching around, I found an interview where Erik Wolpaw where he stated that was the case. Although, that wasnt how it started outthe first iteration had you to leave it behind. Disposing of the cube is better, especially when married with the dialog from GLaDOS. Game design, like most things, is an iterative process.